New Item!!! Call us and ask about our combination lifting and pouring tong with lifting eye and “J” hook. Must have an overhead hoist. This tong to be used with a #10 bilge crucible is in our online store- please call us for all other sizes. MIFCO CRUCIBLE TONGS AND CRUCIBLE SHANKS ARE DESIGNED AND MANUFACTURED ACCORDING TO RECOMMENDATIONS OF THE CRUCIBLE MANUFACTURERS ASSOCIATION. THEY ARE DESIGNED FOR USE WITH BILGE SHAPED CRUCIBLES. with a No. 40 Bent Crucible Tong. 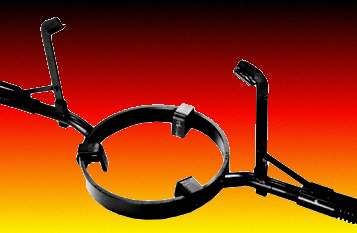 Correctly designed crucible tongs provide maximum safety and crucible life. 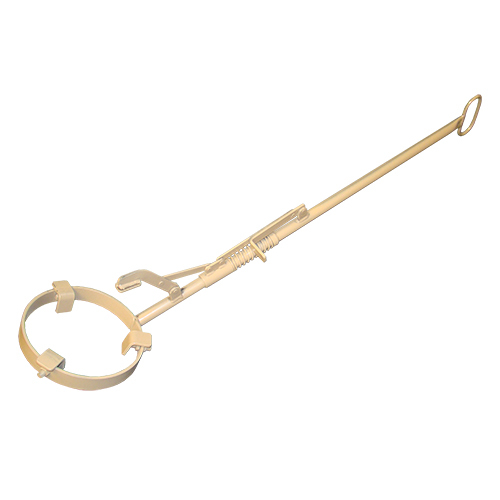 Starting with #40B, all crucible tongs have links and rings. 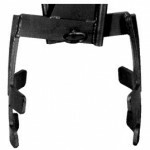 Claw type grippers are die formed to fit the contour of the crucible and apply even pressure. All tongs are built with adjustable stop to prevent excess gripper pressure against the crucible walls. Excessive pressure can crush a crucible of molten metal. Steel webs add rigidity and strength. 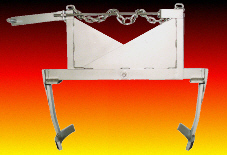 The crucible tongs can be locked open, or closed, with the locking latch. Once crucible is secured in the tongs it cannot be dropped. Correct top clearance prevents pinching and chipping the crucible lip. Improper clearance at this point is the major cause of crucible failure. With lifting eye bolt (40P and larger) and locking latch bar. All tongs are sized to fit bilge crucibles. All tongs are designed to allow room to set the crucible into the furnace chamber and withdraw it for pouring. 030510 10P 10 19 lbs. 030520 16P 16 20 lbs. 030530 20P 20 22 lbs. 030540 30P 30 28 lbs. 030550 40P 40 36 lbs. 030560 50P 50 43 lbs. 030495 4-0000 #4-0 / #P-3 2 lbs. 030600 10B 10 19 lbs. 030610 16B 16 20 lbs. 030620 20B 20 22 lbs. 030630 30B 30 28 lbs. 030640 40B 40 38 lbs. 030650 50B 50 45 lbs. 030660 670B 60 thru 70 58 lbs. 030670 890B 80 thru 90 63 lbs. 030680 1025B* 100 thru 125 84 lbs. 030690 150B 150 105 lbs. *Cannot use with a T-80 Furnace. All tongs are designed to fit bilge crucibles. Used for setting and removing empty bowl crucible. One of the greatest hazards in foundry work is the danger of dropping a crucible of molten metal. The MIFCO Crucible Safety Shank was developed by our engineers at the request of school administrators, to help eliminate this hazard. It is simple in design, yet easy to operate, and holds the crucible securely. This prevents the accidental dropping and dumping of a crucible of molten metal. The Safety Design has been tested thoroughly in school shops and commercial foundries, where safety regulations specify its use. It is available in both the Hand Shank and the two-man Single End Shank. 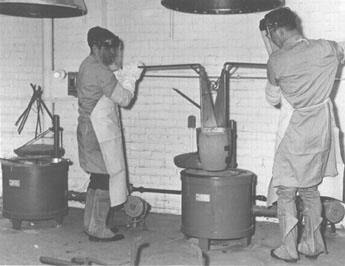 Crucible shanks are foundry tools used to hold the crucible of molten metal while pouring the molds. Shanks are made in two standard designs – the one man Hand Shank and the two-man Single End Shank. Single End Pouring Shank with bail. Crucible rings are die formed to shape and size, insuring correct fit at point below bilge diameter of crucible.Supporting pads placed inside ring for four-point suspension. Design provides air space between crucible and ring. This prevents heat transfer from crucible to band and adds to the service life of crucible and shank. All Single End shanks are offset to provide better balance of the crucible when pouring. Tubular handles for light weight and strength. Handle length and tubing size varies with size shank. 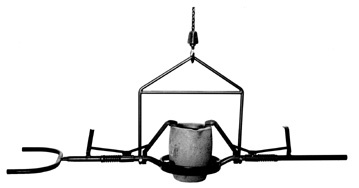 Crucible shank bails available for handling large crucible with hoist and trolley. Using these basic design features, MIFCO developed and added the spring loaded latch as a locking device for the Safety Series. Adequately Held – The spring-loaded locking device holds the crucible so securely in place, it can be completely inverted while pouring. Larger sizes are equipped with double locks. Simple in Design – Simplicity of design insures positive action and dependable operation. Easy to Use – The locking arms swing clear of the shank ring and in no way impedes the loading of the crucible. The latch handle is conveniently located on the shank handle. More Efficient – Entire contents of the crucible can be poured without the risk of dropping the crucible. Labor Saving – Eliminates need for additional help to hold crucible in shank ring while pouring. 030050 new item! S116H-adjustable 10 and 16 15 lbs. THE SAFETY LOCK SHANK was developed to prevent the accidental dropping of a crucible of hot metal. It is highly recommended for school shop use. THE ADJUSTABLE SAFETY LOCK SHANK is furnished on single end shanks only. Each size shank can be adjusted to fit two sizes of clay graphite or silicon carbide crucibles. Adjustable support pads placed inside shank band provides three to four point suspension. Positive adjustment is easily and quickly made. Loosen lock nuts, move pads to desired position, then tighten lock nuts. Double Latch starts at S450SE and larger. 030310 S230SE 20 thru 30 22 lbs. 030320 S450SE 40 thru 50 31 lbs. 030330 S670SE 60 thru 70 40 lbs. 030340 S890SE 80 thru 90 52 lbs. 030350 S1050SE 100 thru 150 65 lbs. Double Latch starts at S450DE and larger. 030440 S116DE 10 thru 16 25 lbs. 030450 S230DE 20 thru 30 32 lbs. 030460 S450DE 40 thru 50 41 lbs. 030470 S670DE 60 thru 70 50 lbs. 030480 S890DE 80 thru 90 62 lbs. 030490 S1050DE 100 thru 150 75 lbs.